Woodpecker friendly tail prop. The Squirrel Buster Peanut + feeder is designed with a large tail prop allowing woodpeckers to feed comfortably, using their tails for support and balance - just like they do on trees. Mess free. 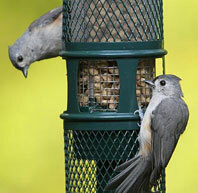 The wire mesh holding the shelled peanuts or wild bird food nuggets is calibrated so that birds cannot simply sweep the food out of the feeder. 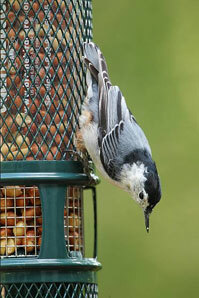 Very small bits that may fall below the feeder will be eaten by ground feeding birds or squirrels. Food is not wasted and there is no mess to clean up. Ideal for decks, condos and apartments. Attracts birds. 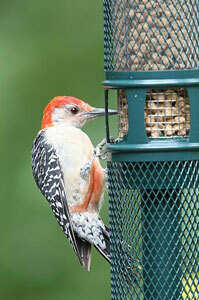 Peanuts are an incredibly popular food at feeders and will attract a great variety of birds. Nuggets, a high energy suet-based soft wild bird food product, are a favorite of all suet, fruit and insect-eating birds. Both are high in protein, oil, and fat, making them a perfect addition to the foods you offer the birds in your backyard. Also attracts: Grosbeaks, Blue Jays, Pine Siskins, Redpolls, Sparrows, Tufted Titmice, Woodpeckers, and Wrens. 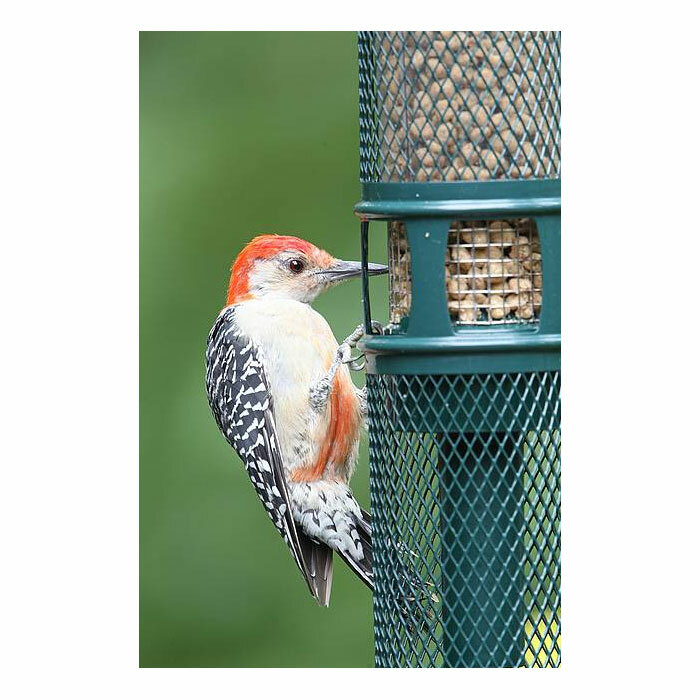 Equipped with patented Squirrel Buster technology, this Brome 1052 Squirrel Buster Peanut Plus bird feeder offers an innovative design that attracts birds while keeping squirrels at bay. The bird feeder holds 3/4 quarts of shelled peanuts or wild bird food nuggets. 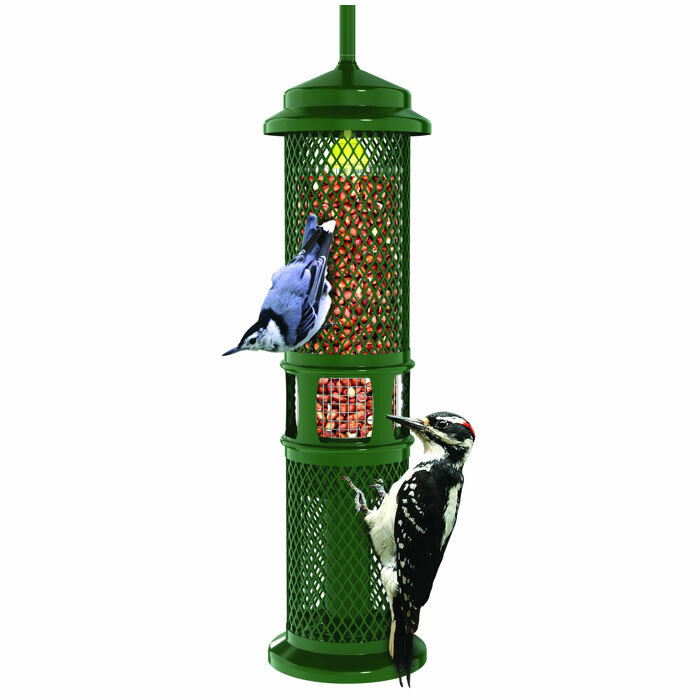 A welcome choice for bird lovers, the squirrel-proof bird feeder attracts a wide variety of clinging and perching birds including the Downy Woodpecker, Red Breasted Nuthatch, Blue Jay, Red Bellied Woodpecker, Tufted Titmouse, White Breasted Nuthatch, Chickadee, and Hairy Woodpecker. Openings in the middle section of the metal mesh shroud align with the wire mesh holding the peanuts, providing birds access to the food. When a squirrel climbs onto the feeder, its weight automatically forces the shroud down, closing access to the ports. Squirrels and some large birds are blocked from accessing the food, but are not harmed in any way. The patented adjustable spring mechanism controls how much weight the metal mesh shroud will support, allowing the birds to feed. Any additional weight will activate the closing mechanism. The spring mechanism is calibrated at the factory to hold 2.5 ounces (70g). It will close fully at 5.3 ounces (150 g), shutting out the smaller Red Squirrels, as well as the larger Gray Squirrels. Start by using the feeder at the factory setting before making any adjustments. 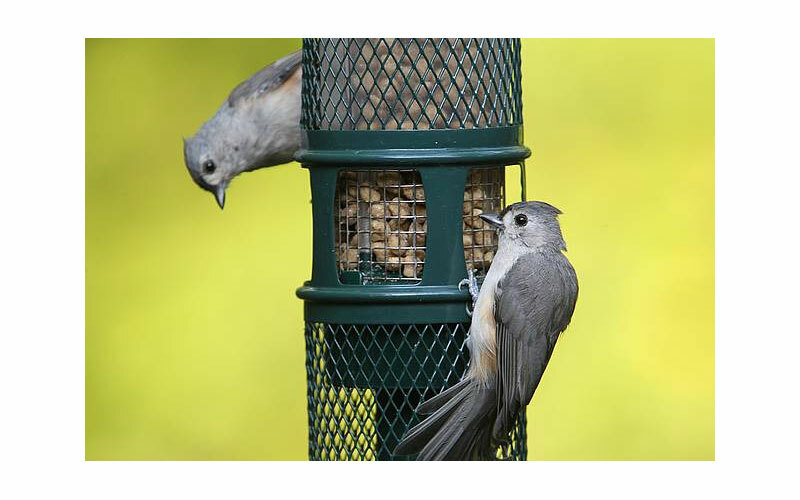 Position your feeder just about anywhere--without having to worry about those pesky squirrels. 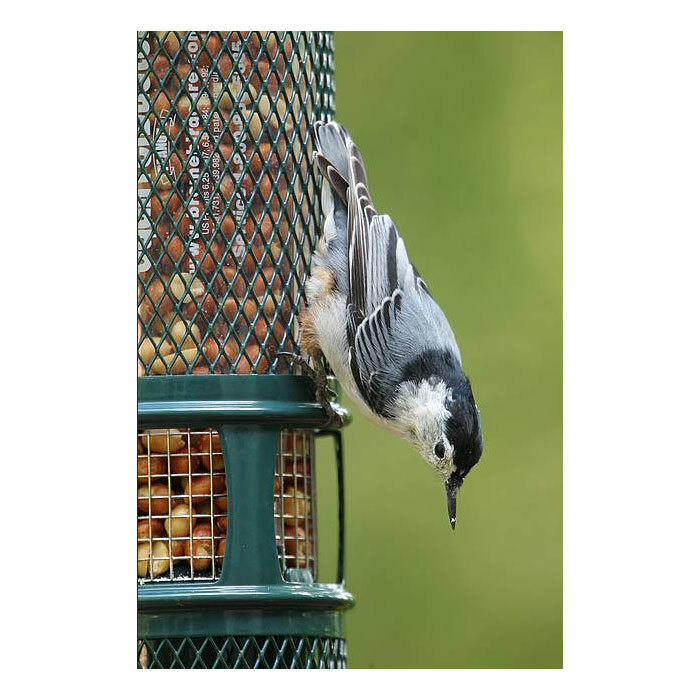 Hang the Squirrel Buster Peanut Plus over a window, in a tree, on a deck or fence, in your garden, on the side of your house, from a rain gutter, or over sliding doors to get great close-up views of your favorite birds. The bird feeder hangs easily with the use of a wall bracket, deck hanger, extension hook, or branch hook (sold separately). The Squirrel Buster Peanut Plus dismantles for convenient filling, and cleans easily. Wash the wire shroud and feeder tube by hand; the feeder tube can also be cleaned on the top rack of a dishwasher.